Buy the brand new DC 0~20V 85C1-V Class 2.5 Voltmeter Analog Volt Panel Meter M25! The 0~20V Panel Meter offers users great simplicity and easily reading. The 0~20V Voltmeter is low power consumption and long lasting. This DC Voltmeter is specially designed for measuring voltage and monitoring battery &amp; electrical system. 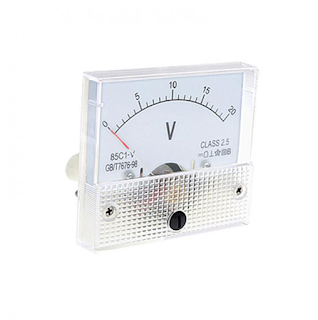 85C1-V Analog Panel Meter with accuracy of Class 2.5 can measure voltage between 0 V and 20 V.